Quality products begin with quality materials and we all want to receive real value for our hard earned money. Luxury watchmakers offer stainless steel in addition to gold & platinum because it has enduring quality you can see, feel and treasure for a lifetime. You too can build customer satisfaction and loyalty by offering your fine crafted creations made with stainless steel. As it is hypoallergenic, does not rust, change color or tarnish your customers will keep coming back for more. Thank you for your interest in our stainless steel blanks! 2. Does not tarnish, rust or change color even if worn in the swimming pool or the ocean. 5. A motorized buffer/polisher removes the excess Sharpie ink very quickly. Otherwise Mr. Clean - Magic Erasers do the job nicely. 6. A sanding sponge (available at hardware or paint store) works great if you wish to give the back or the front a brushed finish. It will remove burrs that maybe present and help hide marks produced on the back from stamping giving your pieces a more finished look. Save the protective film as you can re-attach it after stamping if you will be doming, this will prevent marring the finish. (a) I use a 1 lb. (some prefer the 2 lb.) brass hammer to prevent mushrooming the ends of my stamps. A steel bench block w/ a sound deadening pad underneath the block to dramatically reduce noise. I also use a 6x6 wood post (w/ boards attached at the bottom to stabilize it) to stamp on. I had a home improvement center order a 6 x 6 S4S fir post for me as they did not have it in stock. S4S means all 4 sides are sanded. Although it will have a smaller working area a 4 x 4 can work too, it is lighter which is a plus if you want to stamp at shows. 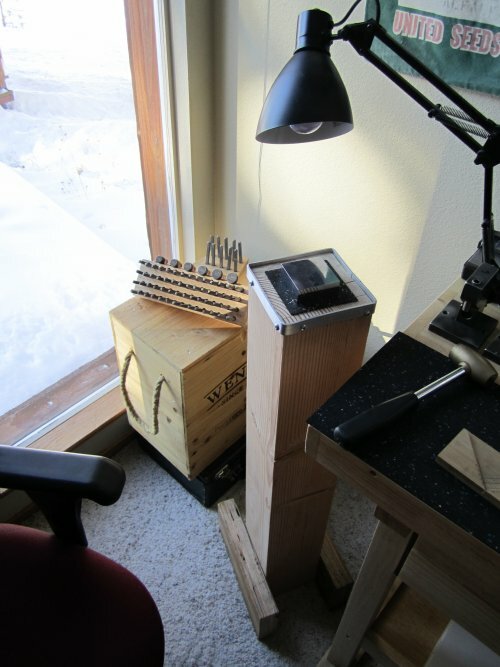 NOTE: a workbench, table or counter top will act as a sounding board and amplify the noise. Font Fixation Lots of fonts/sizes & design stamps to choose from and all are rated for stainless steel! The Designer Stamp Sets by Infinity Stamps. Always be sure to tell the sales associate that you plan to use your stamps on Stainless Steel. Metal Complex & the $20.00 letter sets at Hobby Lobby work well too. Stamps that are up to making impressions in SST for the long haul need to have a Rockwell hardness rating of 58 or higher. Remember too that dull stamps will result in faint impressions. I also do not recommend the popular round shank design stamps. I know they are low cost and there are a lot of nice designs, but the fact is even new they are quite dull and scary to use on SST, I don’t even like using them on sterling silver. (c) The die in the lower jaw of the punch can be screwed in/out, to obtain the best leverage and to prevent bending your blanks adj. it as low as possible while still being able to punch completely through the blank. (d) As an alternative some prefer to use paint pens or automotive touch-up paint, you'll want to wipe excess off quickly. The Premium Punch ($99.00 w/ Kit, $75.00 Punch ONLY) is made in the USA and is the one the Power Punch ($42.50) is designed after. It is higher quality and if used w/ the optional bench mount** ($35.00) is considerably faster and easier to punch holes. If you do not have a workbench it can be mounted to a board and a C clamp or bar clamp could be used to attach it temporarily to your table. The Power Punch is a good economical tool that will get the job done too. You will occasionally need to put a drop of 3-in-1 Oil (available at hardware or even grocery store) at each pivot point and the punch pin itself, this makes it easier to punch the hole and easier for the blank to pop off of the pin. Adjust the die in the lower part of the jaw as low as possible and still able to punch completely through the blank as this will give you the best mechanical advantage making it easier to punch holes and not push the blank any higher on to the pin than need be. When you notice a burr being produced on the back of your blank it is time the replace the punch pin & die. After a while the protective rubber coating around the pin opening will come off, no problem to redo. I use liquid Plasti Dip from the hardware store, Tool Magic is another similar product (liquid electrical tape would work well too :) Be sure to stir very well, I use a long wood fireplace match for that. Dab a small amount of Plasti Dip on the end of a short craft Popsicle stick and apply around the punch pin opening. After doing so I lean the punch upside down against something stationary and allow it to dry at least 1 hr. I repeat this process for 2 add'l. coats. After it has dried I carefully cut the excess around the punch pin off with a razor/utility knife. To modify the depth gauge remove it from the punch, hammer it flat then cut & grind the narrow end to about 3/16" wide and finally re-bend it right at the point where it gets wide. This allow the gauge to be adjusted much closer to the punch pin.